A commercial fisherman, also known as a fisher, uses equipment like nets, fishing rods, and traps, to catch fish and other marine life that will be consumed by humans or used as animal feed or bait. Some work as members of large crews on big boats in deep water. Other fishermen work in shallow water on small boats with a very small crew. 27,000 people work as fishing and hunting workers (2016). Many commercial fishermen are self-employed. The job outlook is excellent, according to U.S. Bureau of Labor Statistics (BLS) predictions. The government agency expects job growth to be faster than the average for all occupations between 2016 and 2026 as the demand for seafood increases. There will be more seasonal than year-round jobs available, as well as more opportunities to work with large fishing operations than small ones. *The U.S. Bureau of Labor Statistics does not report separate employment figures for fishing and hunting workers. Most jobs for fishermen are seasonal. Since opportunities are typically available during the summer, teachers, students and others who are off during that time fill those positions. Most people get jobs through recommendations from friends and family. This job will take you away from home for weeks or months at a time. 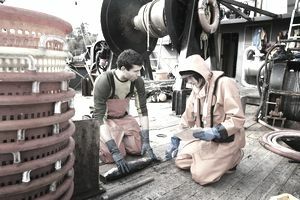 Fishermen risk getting injured or killed on the job. Drowning causes most injuries and fatalities. For an excellent perspective on what it is like to work as a commercial fisherman read "So You Want My Job: Commercial Fisherman." While you aren't required to get formal training, your ability to find a job will increase if you attend a two-year vocational-technical (Votech) program. These programs are primarily available in coastal regions at community colleges. Many commercial fishermen receive on-the-job but to operate a large vessel they must enroll in a program approved by the U.S. Coast Guard. You may need a merchant mariners document, issued by the Coast Guard, to work on certain fish processing vessels. Other licensing requirements vary state-by-state. Permits issued by state or regional fishing councils are also required. When looking for a job, ask family and friends about openings. Also go directly to the captains of fishing boats to find out if they are hiring. You can even look online, but remember that job openings are usually posted seasonally. It is likely to begin a fishing career as a deckhand before becoming a fisherman. After gaining experience, you may become a captain's assistant, also known as first mate, a boatswain who supervises the deckhands, and, eventually, the captain of a vessel. What Soft Skills Do You Need? Speaking and Listening: These skills are useful for communicating with boat captains and crew members. Critical Thinking: The ability to weigh the pros and cons of various solutions to problems comes in handy when you must react to deteriorating weather conditions. Attention to Detail: You must be able to evaluate the quality of your catch. Sources: Bureau of Labor Statistics, U.S. Department of Labor, Occupational Outlook Handbook; Employment and Training Administration, U.S. Department of Labor, O*NET Online (visited August 9, 2018). What Is It Like to Be a Customer Service Representative? What is It Like to Be a Nuclear Operator? What is a Construction Helper? What Does a Tax Examiner Do? What Is a Dental Technician?